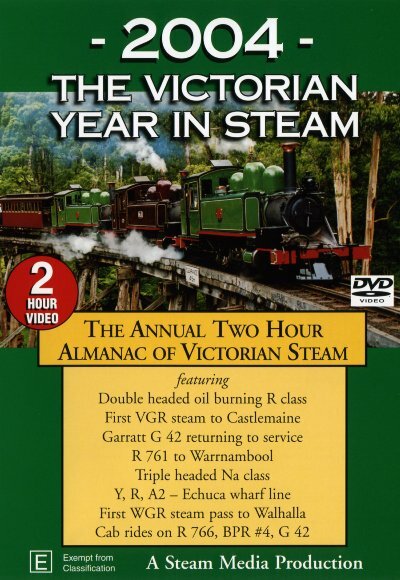 2004: The Victorian Year in Steam: the eleventh production in this very popular annual almanac series continues the usual excellent production standard in this all-colour, all-digital DVD which records the ever-changing Victorian rail scene. 2004 saw three locos return to service after overhaul; two new sections of main and tourist line each saw steam for the first time; double heading R 711 & R766 combined for the first and last time. Anniversaries celebrated included the 50th anniversary of the J class celebrated at Maldon with J 549, whilst 150 years of railways was marked with operations by K 153, K 160, K 163 and K 190.
first steam run on the 'new alignments' between Melton and Ballarat and much more.